She is the greatest assassin her world has ever known.But where will her conscience, and her heart, lead her?After a year of hard labor in the Salt Mines of Endovier, eighteen-year-old assassin Celaena Sardothien has won the king's contest to become the new royal assassin. Yet Celaena is far from loyal to the crown – a secret she hides from even her most intimate confidantes.Keeping up the deadly charade—while pretending to do the king's bidding—will test her in frightening new ways, especially when she's given a task that could jeopardize everything she's come to care for. And there are far more dangerous forces gathering on the horizon -- forces that threaten to destroy her entire world, and will surely force Celaena to make a choice. Where do the assassin’s loyalties lie, and who is she willing to fight for? This review may contain some spoilers! Celaena is now the King’s Champion and she is fulfilling her duty by assassinating the enemy’s of the King. Or is she? When the King gives her the name of her next target, Archer Finn, she recognizes the name and knows him from her assassin training. She starts to spy on him to see what his motives are and why the King is targeting him and she discovers that he is part of a group that is trying to find the lost princess, Aelin Galathynius, the heir of Terrasen. Celaena and Chaol are also building up their relationship that is becoming more than just a friendship. But Chaol is wary of it because of his loyalty to the King and to his best friend Dorian, the Crown Prince. Celaena and Nehemia’s friendship continues to grow as they spend more time together. Nehemia agrees to teach Celaena the Wyrdmarks but something terrible happens to Nehemia and Celaena places part of the blame on Chaol. Celaena is also still trying to uncover the secrets of the Wyrdmarks and gets some answers from a witch that is working at a carnival at the castle. The witch tells her that the riddle, she found, describes the three Wyrdkeys that open the Wyrdgate. Celaena thinks that the King has the first and possibly the second key, so she must find the third key before he does. She wants to contact Nehemia to get some answers so she opens up a portal to another world and an evil creature steps through the portal into their world. Celaena, Chaol and Dorian must put it back through the portal before terrible things happen, but Fleetfoot, Celaena’s dog, chases it back through the portal. Chaol goes in to save the dog and Celaena follows, because she will not lose both of them. Celaena transforms into a Fae, her true form because there is magic in this world and Chaol sees her transformation. Meanwhile, Dorian has suspected the relationship between Celaena and Chaol for a while now because of the way they look at each other. But Dorian tells himself that he is over her and is going to move on. He starts to spend a lot of time in the library because he has discovered something about himself. He’s discovered that he has magic. He starts researching the genealogy in his family to find out where this magic has come from and how he can control it. If he shows any sign of it to his father, his father will have him killed. Chaol thinks that Celaena will be safer somewhere else, so he makes an agreement with the King to send Celaena to Wendlyn and in exchange he will step down as the Captain of the Guard and go back to his home in Anielle with his father. As Celaena is leaving, she tells Chaol everything! Everything about the Wyrdkeys and that the King has some terrible plan to use them. And she reveals the biggest secret of all about herself. That she is the heir of Terrasen, Aelin Galathynius. I’m so sorry about this review having spoilers. It was honestly so hard to write this review without spoiling anything so that is why their is a warning. This book was definitely better than the first! And I hope that the trend will keep going with each book but I really don’t even know if that is possible. There was so much going on and I loved it all! First of all, in the first book, I was team Dorian. But I did love to see Celaena and Chaol together in this book. My heart was breaking for Dorian though. But I’m really not team either of them now. I think that Celaena might meet someone else in Wendlyn but I hope that she still remains friends with Chaol and Dorian. I also was really enjoying that Celaena had a girl pal, Nehemia, and I was pretty devastated to see her go. There was so many moments in this story that I really couldn’t see coming and I really enjoy that about a book. Celaena is one of my favorite female characters now and I love reading about her story. I would love to also see more about Dorian and how he comes to use his magic because I think he is going to do great things! We still don’t really know what the King’s plans are and I’m very curious to find out what exactly his master plan is. I know he’s evil and whatever he has planned can’t be good, but I’d still like to know. I can’t wait to read the next book, but I’m actually going to read The Assassin’s Blade next, since it was published before Heir of Fire but I’m excited for both! Everyone was right. 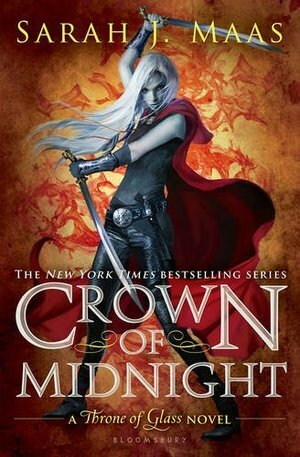 Crown of Midnight was a fantastic sequel to Throne of Glass and everything just totally STEPPED IT UP A NOTCH. Sometimes I have to reel myself in and remember that this is not a trilogy so things need to take time to flesh out and I actually really love that. Nothing feels rushed or forced and everything really had time to develop. This was really fantastic and I cannot wait to dig into Heir of Fire now! Full review posed HERE on The Book Addict's Guide 9/10/14: True to everyone’s word, CROWN OF MIDNIGHT really was the sequel that blew THRONE OF GLASS out of the water. Don’t get me wrong — I really did love THRONE OF GLASS — but Sarah J. Maas really stepped everything up a notch in this fantastic sequel and I was hooked from the first page! The last one hundred pages or so just had me going "oh snaps wtffffff." I was going to give this two or three stars but there's something about it that drags me into its twisted joy. While this wasn’t bad, I didn’t like this as much as book 1. And surprisingly the action parts were the most boring ones in the book… Those were also the most ridiculous ones because she’s supposed to be this badass assassin, and in reality she’s too soft hearted and gets caught most often than not. In the last book I thought Dorian was annoying and too superficial but he did grow up in this book. I don’t remember if we had his POV in the last book but at least in this one it worked well. Even though I like Chaol, I can’t but wonder his stupidity at times. I think he trusts the king way too much and he should doubt more about what the king tells him. I’d like Chaol to be little more hardened especially since he’s the Captain of the Guard. But he’s still my favourite character.